The Tour de France, which kicks off July 5, is a grueling test of human endurance, a three-week 2,175mile (3,500 km) race stretched over 21 stages, nine of them in the mountains. But in some ways the modern Tour is easier than races past. In the early 20th century, competitors pedaled the dirt roads of France through the night on fixed-gear bikes, evading human blockades, route-jamming cars and nails placed on the road by fans of other riders. 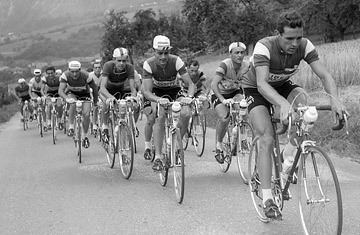 Between stages, teams feasted on banquets and champagne; before climbs, they fortified with cigarettes.